“I finally cracked it.” Those four magical words from the new Steve Jobs biography reignited rumors about Apple’s intention to reinvent the last big screen in our daily lives: The television. Here’s what that would look like–and why it should happen now. Apple television rumors have swirled for years. But only now do we know that when speaking to his official biographer, Steve Jobs was keen to reinvent the television. And after ages trying to polish it into a user-friendly interface to video content he finally felt he’d “cracked it.” Excitement has grown quickly since this revelation, but one analyst–Gene Munster–has checked with his sources and says that test HDTV prototypes are already in the pipeline, suggesting the device could be en route sooner than we thought. In a hundred ways an Apple television makes sense, but Apple is really leaping into new waters here–and they’re both cluttered with the detritus of devices of yore and shark-infested. That Apple could take the television and re-imagine the way viewers would interact with it is, I think, a given. Apple has consistently demonstrated that it can make interacting with its gizmos a pleasure–from the original Mac UI through the iPod click wheel to the elegant iPhone operating system. Some guesses on how an Apple TV could work: It could involve a wireless iPod Touch-like controller, actual iPhones or iPads, or possibly a physical gesture-based system (remembering the body-tracking tech Apple acquired and has recently dropped into its Photo Booth system for fun). In fact, this aspect of an Apple television may even be the least interesting. We can guess it’s different, it’s powerful, and it would simply “just work.” Having said that, there’s always the opportunity that Apple could take its impressive Siri technology and apply it to the television, bringing a little techno sci-fi magic to the TV-watching experience. A voice-controlled TV (clever enough to ignore accidental “control” words spoken on-screen, but to listen to its users) would likely catch sales fire in the marketplace. Yet more interesting, though, is the way an Apple television would be built–and what it would be for. 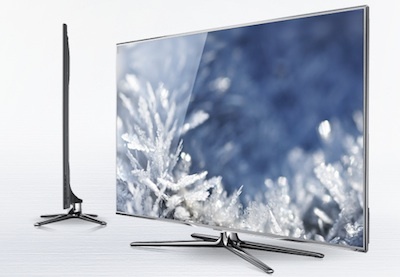 In terms of design, many brand-new HDTVs embody classic Apple design attributes already. An exemplary unit is (ironically enough, given Samsung’s Apple-cloning ways) Samsung’s latest Smart range that has the TV boiled down to its purest component: A screen with a tiny, almost self-effacing silver-edged frame, no physical buttons, no frills, and a super-skinny carcass. 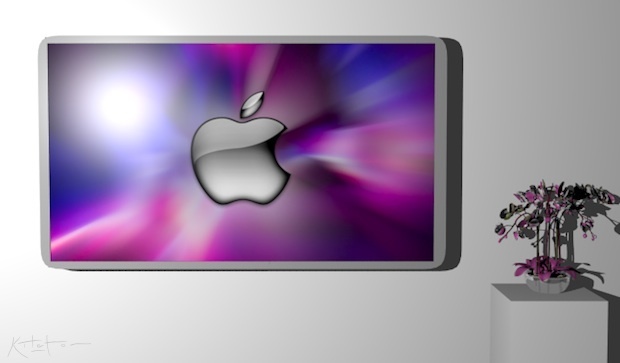 If Apple is making a TV, then you can imagine that in terms of design it may approach something like this, although it may also co-opt in design elements from the iMac and iPad with a simple all-aluminum body. Innovation in the design would really extend to the actual quality of the image Apple could achieve (remembering Apple’s been very careful in choosing cutting-edge tech for the screens of its mobile devices) and in terms of the technical details like how it’s mounted, how neatly cables could be routed to it, and so on…the seemingly trivial bits of spit and polish that Apple always concentrates on. Inside the set’s carcass we imagine Apple would stuff wireless and wired networking hardware and an Apple-branded Ax-series processor so the device could run a version of iOS (like the current set-top Apple TV does), and there’d be a good chunk of flash storage so that any network-streamed content could be locally cached and thus prevent hang-ups. A webcam may well be dotted on its facade somewhere, ready to make FaceTime and Skype video calls possible (and thus appealing to the enterprise market as well as the home). And that’s really about it. Simple and relatively inexpensive additions to the existing components in an HDTV. We don’t imagine Apple would embrace the current vogue for 3-D–it just not a polished enough technology for the house that Jobs built. This is, in a way, what companies like Netflix and Hulu have tried to do–although Netflix hasn’t always done it elegantly, and recent disclosures suggest its business is still mainly DVD-centric. And Hulu has had difficulties finding a buyer, suggesting interested parties were wary of its business model and future prospects. Google TV is an unknown quantity, and Google’s branded TV products made via a suite of partners have badly flopped. But Amazon is a rising peer, and it’s perhaps in Amazon’s model we see a grain of what Apple wants to do…or possibly the other way around. With its recent push to cloud tech, and its highly Amazon-media-friendly Kindle Fire tablet launch, Jeff Bezos’s baby is trying to push milions of consumers into its content delivery channel for e-books, music, TV shows, and streaming movie content. Consequently it’s easy to imagine an expansion of the iTunes movies and TV store, with greater access to a broader selection of shows and films and a variety of ownership models, from streaming to actual download (backed up via iTunes Match and thus available 24/7 on your iPhone and Mac as well as the family TV). One can almost imagine Jobs pitching the idea to movie studios and TV show creators, trying to skip as many middlemen in the current distribution structure as possible, with a line like “So, we’re making a TV. It’ll be the best TV there ever is, and it’ll sell by the millions. If you wanted, those consumers could be watching your shows on it, distributed when and how you best think suits–with some guidance from us. You’d get a bigger slice of the viewing profits, and a share of in-show ad revenues. Social and demographic data feedback would be incredible.” That’s a pitch that could sway industry folk in a way that Hulu and even Amazon probably can’t match. Until now, iTunes hasn’t really been a massive profit maker for Apple, although its importance is undoubtedly growing (with Apple’s 70% share of revenues from apps, books and magazines, and more sales of iPhones and iPads pushing consumers to use iTunes rather than an alternative). iTunes helps sell hardware, on which Apple makes a great markup. But it can be argued that with television iTunes, if it were to sell millions of units, Apple could start making cash from iTunes–as consumers get comfortable handing over micropayments of a handful of cents to see fresh shows or a few dollars to see a movie, and the studios get more content with this revenue model as it short-circuits some piracy. The streaming model is gaining traction in consumers’ minds too, with businesses like Spotify and Rdio disrupting even some of iTunes’ business. So perhaps this is an idea whose time has come. More than this though, Apple’s true draw to get consumers buying their television would be apps. And not apps in the sense that Yahoo-connected TVs and Google TVs have apps, but Apps–with a capital “A” and all the familiarity of Apple’s App Store. We talked about it before, and it’s still an exciting idea now. It starts with Skype, FaceTime, and weather apps of course (which brings that Siri notion back to mind) but then it moves on to Twitter and iPhoto and the family calendar, ending at information-rich news apps and, inevitably, games. The potential for Apple to quickly get into the “console gaming” business at the expense of Sony and Microsoft, by simply shifting the hundreds of thousands of games for the iPhone onto the big screen, is well known. Google’s well aware of the potential of games and Android 4.0 has support built-in for USB-connected gaming handsets…which gives us a clue as to how Apple could do it: More elegantly. Picture a variant of its large touchpad peripheral, bringing multitouch support to a controller, with a few extra motion sensors inside–ripped directly from the iPhone motherboard. There is but one question that really dogs the idea of an Apple television, and it’s about price. Munster guesses Apple would position the device at the premium end of the market, aiming perhaps for a price of $2,000 or so. This would fit Apple’s model in some ways with iTunes pushing sales of iPod and iPhone hardware, and it tallies with the low-margin, low-turnover nature of the TV business which has bothered many of its current bright-lights. But unlike the one-off payment a company like, say, Panasonic gets when a consumer buys a television (and then doesn’t spend again for five years or more), Apple would get continuous drips of income thanks to the app model and subscription TV services…allowing it to price the set more aggressively. And Apple has, recently and thanks to smart investments in its supply chain, reinvented itself as a mid-price-but-premium-design outfit, starting with the industry-unsettling price of the iPad and the iconic MacBook Air which is troubling would-be cloners like Asus and Acer. Which means it could pull off a similar trick in the television game. All of this thinking is given an extra spin of novelty thanks to a fresh rumor that Jeff Robbin, who made iTunes and also co-created the iPod, is now heading efforts inside Apple to deliver a connected TV. But there’s one thing to remember: This device is not going to be what you think. As with most Apple innovations, the success of the Apple television won’t come down to its design alone, or its screen or any other single aspect. What you’ve got to imagine is the synergy of a hundred elements, not all of which are necessarily brand-new, brought together with polish and smart thinking: Classic Apple. If Apple does pull off a super-slickly designed television, with a sci-fi-like user interface, thousands of apps, new access to TV and movie content, and a killer gaming interface, priced at or only slightly above its peers in the market, that’d be a device that would sell. Perhaps Steve Jobs’s final “one more thing…” would be to turn off Apple’s hobby project of the Apple TV, and give the television-addicted world a whole new, delightful way of using the biggest screen in their homes. When all that happens, consider the case cracked indeed.